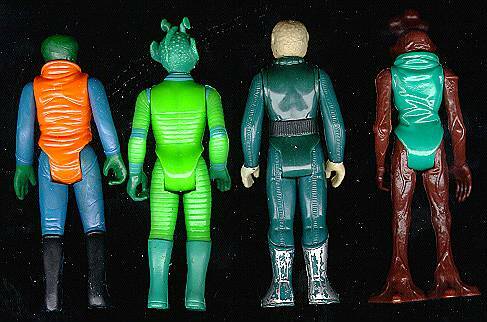 As very few pre-1980 prototypes seem to have survived from the vintage line, first shots of figures from the original Star Wars series are somewhat more sought-after than their later counterparts. 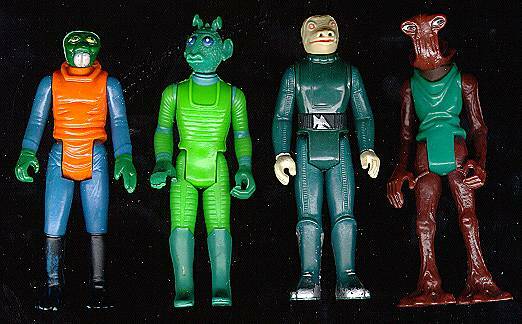 These four are from the Sears Cantina playset and include the relatively rare Blue Snaggletooth figure which was available only through Sears. The major difference between these first shots and regular production figures is the lack of production markings on the backs of their legs, the details for which would have been added to the tooling only after figures like these had been produced. The paint used here also differs from that found on production figures. It is more flexible and was probably spray-applied by hand rather than by a factory process. Fully-painted first shots such as these would have been used for marketing purposes, such as promotional and packaging photography.